Wake up everyone, spring is here, and I am sure we are all looking forward to what this gardening season will bring. You must have noticed that the days are getting longer, and the sun’s rays are very warm making this time very magical especially after such a cold and bitter winter. March 20th was the Vernal Equinox, a date recognized and celebrated all over the northern hemisphere as the beginning of the planting year. It is a time for fresh starts in all phases of life, at home, in relationships, and most of all in the garden. If you haven’t started already, it is time to start indoor seed planting. I also have many plans for the garden and can’t wait to start playing in the soil. There will be new flower beds, new plants, new rose bushes and so much more. So enjoy the power of spring, its regenerative effects, and don’t forget to party. This new Canadian rose has a two-tone red and white bloom, is hardy and short, can even be grown in a patio container. It has dark green, disease-resistant foliage, hardy to Zone 2b. 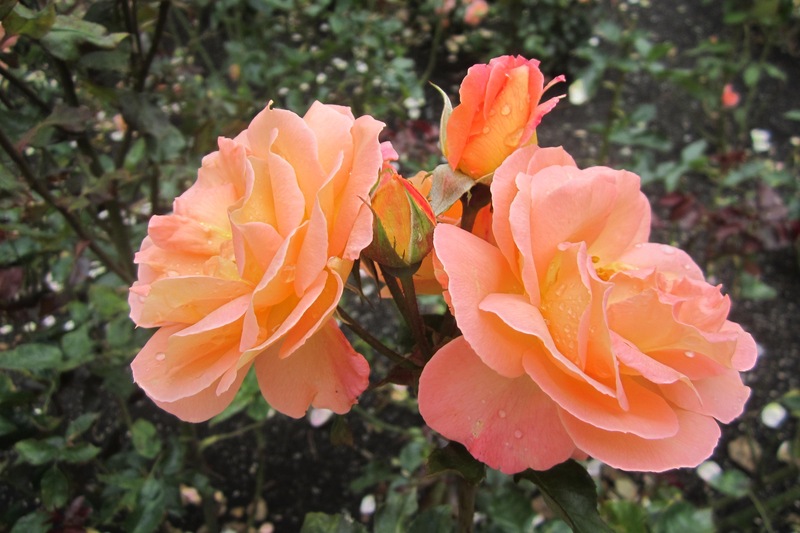 The background breeding stock was from the Morden Research Station, Manitoba, but was moved to Ontario (because of Government closures) to further the development of Canadian roses by The Canadian National Landscape Association. The breeding and development takes place at Vineland Centre for Research & Innovation, but all new stock are trialed and tested across Canada. Out of this stock has come the Artists’ series of roses: Emily Carr, Felix LeClerc, Bill Reid and Campfire. Foundation” (started by a former CFL player) which supports people living with cancer. The royalties from the sales of this rose go to the foundation. At the 2014 Grey Cup game, this rose was introduced and should be available this spring at certain Garden Centres. HRS might even have some available in 2016. So we have another truly hardy shrub rose, which is easy to care for in our national colours of red and white to enjoy in our gardens. Renew your HRS Membership! Please complete the Membership form at the end of the newsletter. Sept. 15th How different growing conditions exist in the same garden. Ways to compliment your flowers to add interest to your garden all season. Ideas for 2015 — We are always interested in what topics our members would like to have for our programs. Send your ideas to any board member or put your topics in the suggestion box at each meeting. Special Offer for HRS Members! For the first time we are offering, to our members, pre-orders before the roses go to the Markets. The price is $19 each or 3 plus for $18 each. If you are attending the April 21st meeting, please bring your order and payment. 3487 Hedgemere Landing , RR3 Orillia, Ont. L3V 6H3. All pre-order requests must reach me by April 21st. All rose pre-orders must be picked up at either Barrie or Orillia Farmers’ Markets – please specify. Visit http://www.huroniarose.com to view the list of roses available to enhance your garden. I’ve always wanted to add Miniature Roses to my garden. What advice would you give for the selection, planting and care of miniature rose plants? in anticipation of the winter season, and, as for regular roses, mound new soil around the crown, after removing any spent leaves or blooms. Once the ground is frozen, cover in between the soil mounds with leaves or evergreen branches. 1“Tips on the Care and Culture of Miniature Roses,” Huronia Rose Society. ￼Renew your HRS Membership! For those who haven’t already, please complete the Membership form on the next page. Please note that Member names and addresses are not made public. *Your name will be forwarded to the appropriate Rose Society Director. Amount: $ 12.00 [ ] Individual or $15.00 [ ] Family NOTE: Memberships expire October 31st.